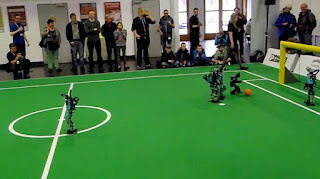 The robot football season is upon us – and Bold Hearts, the University of Hertfordshire’s Humanoid Kid-sized robot team, was back in action in the first of this year’s major competitions, the RoboCup German Open – which took place at the end of last week in Magdeburg, Germany. 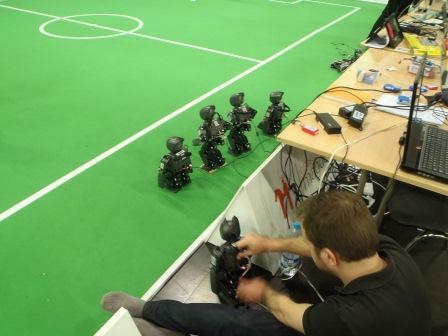 During the RoboCup competition, students pit their team of robots against each other – demonstrating their robotic football talent . The robots are not under remote control – they act autonomously, and coordinate their actions via wifi to work together as a team – they need to know who to pass to, how to get past a defender and, most importantly, how to score a goal! Teams use state-of-the-art artificial intelligence with the aim that by 2050 a team of robots will be able to take and beat the best human players – to be the world champions! Bold Hearts started with a 4-2 win against WFWolves – and, just like last year, Bold Hearts actually scored all the goals! So great news - Bold hearts can definitely score - but goal awareness (is it the home goal or the opponent’s goal??) maybe needs a little work! The next game was against one of the strongest opponents – FUmanoids from Berlin. It was a tough match. Bold Hearts made some last minute changes to the team – introducing better team-awareness. However, it wasn’t quite good enough to be the winner of this match - and so Bold Hearts lost 1 – 3. Although Bold Hearts scored a beautifully elegant attack goal – very Lionel Messi! With two matches under their belts, the Bold Hearts robots were beginning to improve their situation awareness – their players suddenly turned from attacking their own goal to becoming a defender of their goal, once they had understood that they were attacking their own goal. However, it wasn’t enough to win against such a strong team as FUmanoids. Bold Hearts made it through to the semi-finals – to play Bit-Bots from Hamburg. Bold Hearts scored in the first half, and Bit-Bots scored in the second half. And with no further goals in extra time, the match went to a penalty shoot-out! Some penalties Bold Hearts missed, some Bit-Bots missed. For every goal that Bold hearts scored, Bit-Bots got one back… until it went to sudden death – and on the very last kick, Bit-Bots missed and Bold Hearts scored… so Bold Hearts made it through to the final of the RoboCup German Open! 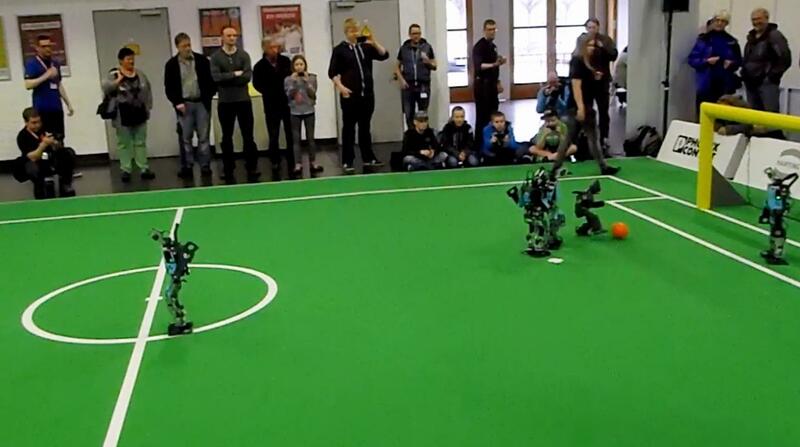 Saturday 5 April – finals day of the RoboCup German Open – Bold Hearts were to meet…..FUmanoids from Berlin again! FUmanoids scored a good goal early on, but Bold Hearts did not give up – scoring a great equaliser. Then with a completely undefended FUmanoids’ goal, two Bold Hearts’ players managed to miss the open goal!!!! This was because the robots had become more careful and therefore slower as they were trying to avoid scoring own goals. The FUmanoids counterattacked and then in the very last few seconds of the second half, they scored a goal – a lucky one for them! It was a worthy final – and the Bold Hearts team is delighted to be runners up in the RoboCup German Open! Now robots are packed to travel safely to the next round of RoboCup – the Iran Open 2014! Many congratulations to the Bold Hearts Team - Sander van Dijk, Drew Noakes, , Daniel Barry, and Daniel Polani (Head of the UH RoboCup project).